But, as the blogger of sous vide recipes for the home cook for the mighty SousVideTools.com I was recently asked to get on board the burger train and blog a sous vide burger recipe. Research commenced and my god, this is a food minefield. The cut of the beef. The fat content. To stuff of not to stuff. How to season and with what. And then there’s the question of sauce. From traditional ketchup to hipster baconjam, it seems picking what to dress it with says just as much about you as the car you drive, your postcode or where your latest handbag came from. After some trawling I decided to have a go at ‘special sauce’. Yes it has some potentially dodgy connotations, but there’s nowt sinister about it. 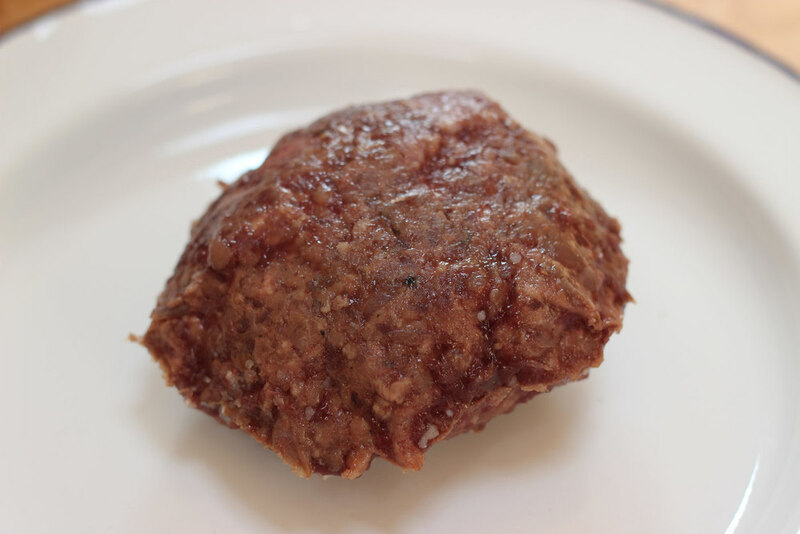 It’s a glorious mix of creamy, sweet, peppery and vinegary – all in perfect harmony, which to my palate was just the ticket on top of a burger made from ground chuck with 15% marrow in the mix. A decision I made after remembering the burger we tried and devoured at sous vide school. In terms of temperature it took a bit of deciding. When eating steak I generally go rare, but the inclusion of slinky marrow in the mix had me wondering if 56°C would work. From what I read it seems that cooking marrow at low temperatures is safe, but too low and it can still be wibblingly pink and leaking haemoglobin. Not a good look. Instead of going to 60°C for medium doneness, I decided to split the difference and try out 58.5°C. Now, it may seem a bit counter intuitive to cook a burger in a water bath at all, after all, say ‘burger’ to someone and it’s likely to conjure images of deliciously charred meat. Well, doing it first in the bath before finishing in a pan or on the BBQ yields an incredible result. The meat is pink and tender as hell, super rare and super juicy, with just the very outside taking on the delicious BBQ smoke we all know and love. So I guess the main question is, has this burger experience turned me? Well, I can’t promise to adopt them as part of my regular diet (without setting up camp in the gym) but I can confirm my husband (a burger scoffer) is very happy at this revelation, and turning out sous vide burgers will be a wifely duty I’m only too happy to perform. Start with the brioche buns. Whisk the custard powder into the milk and pour into a saucepan. Bring to the boil, stirring all the time. Remove from the heat, stir in the butter and sugar until melted, then pour into a mixing bowl and leave until barely warm. Add the flour, yeast and salt, mix well and leave for 10 minutes. On a lightly oiled surface, lightly knead the dough until smooth, then return it to the bowl and leave covered for an hour and a half. Next make the burgers. Sauté the onions until lightly golden and then leave to cool. Once cold mix the Worcestershire sauce over and spoon over the beef mix in a large mixing bowl. Season the beef and marrow mix generously with sea salt and pepper and then mix in by hand to combine and mix in all the onions. 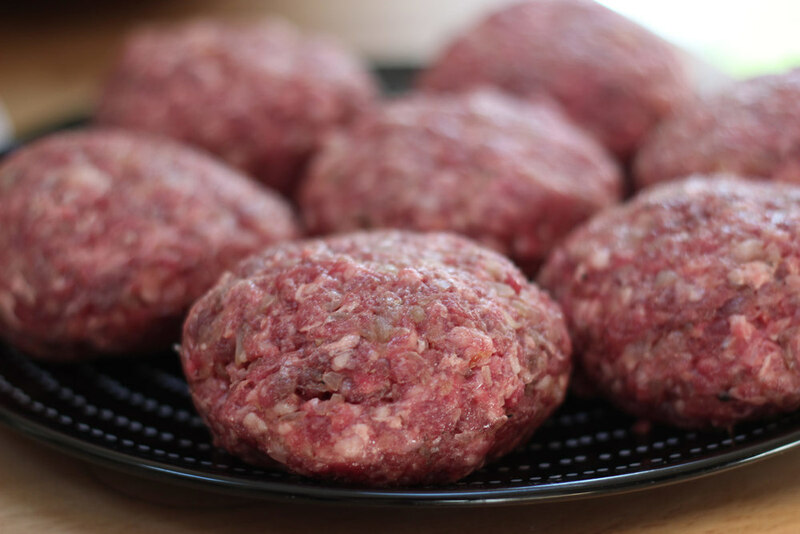 Form 8 200g patties out of the mix and place them onto a plate then put into a very cold fridge for an hour to chill down. While that’s happening make the slaw and special sauce. Into a large mixing bowl place the mayo, yogurt, lemon, olive oil, pink peppercorns, a scrunch of sea salt and pepper, mix until combined. Then add the carrots, cabbage and onion and mix through the mix by hand. Put in the fridge to keep cool. 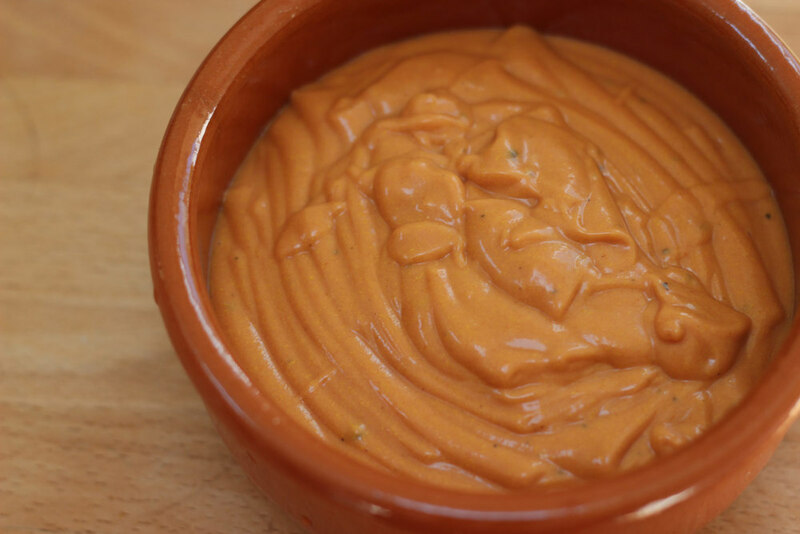 For the special sauce simply combine all the ingredients in a bowl and mix thoroughly. 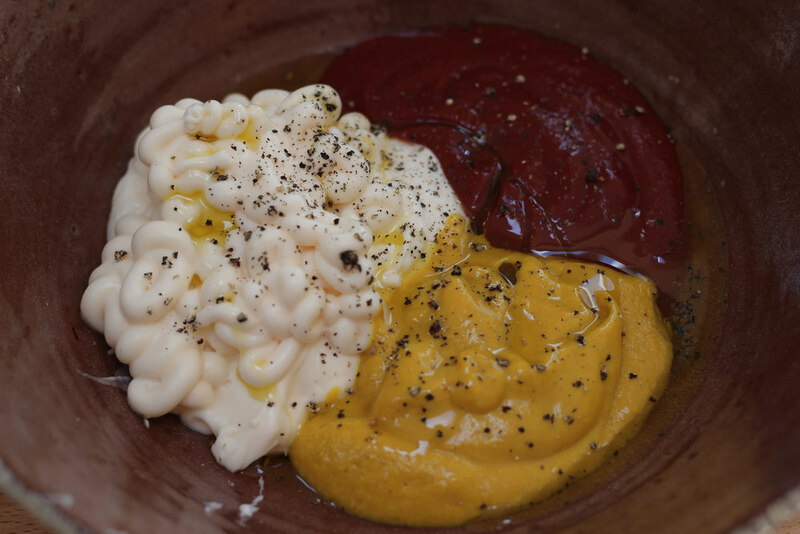 Test the seasoning, it should be perfectly balanced between sweet, hot and umami against a creamy backdrop – play around with the mix until you’re happy then put in the fridge to keep cool. Now back to the buns. 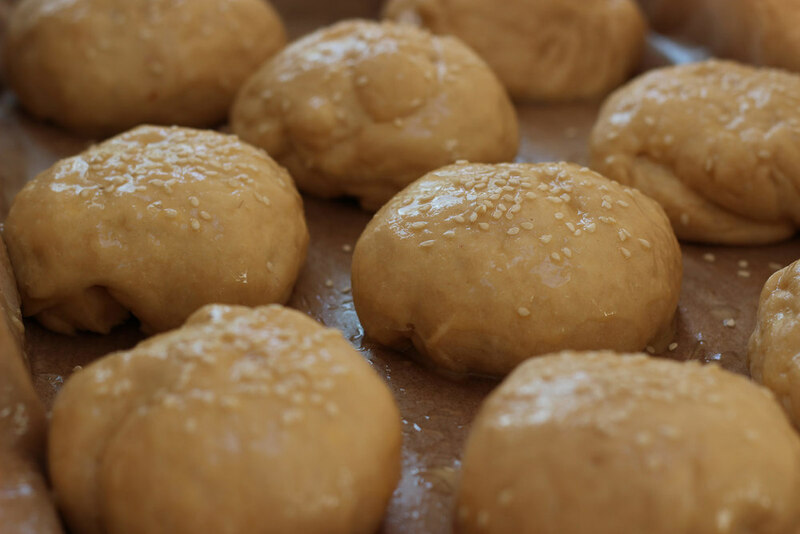 Divide the dough into pieces (about 200g) and using a little flour, shape them into balls. Place them on a lined baking tray and flatten slightly with a rolling pin. Cover and leave to rise for about an hour or until they have doubled in size. While they are proving take the wedges and put them into a large saucepan and cover with cold water. Bring to the boil and let them boil for around 10 minutes then drain and cool, leave them in cold water until you need them. Place your sous vide onto heat up, you want 58.5°C. 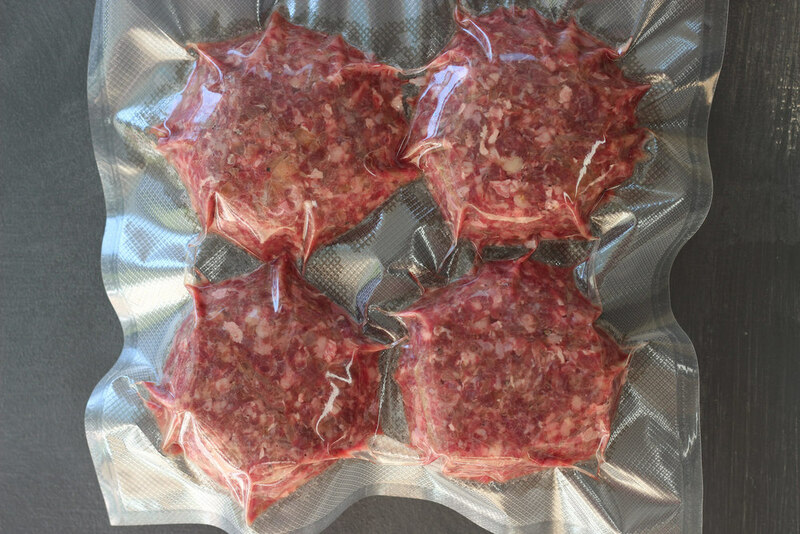 After the patties have been in the fridge for an hour take them out of the fridge and vacuum seal them ready for the sous vide. Once they are at temperature place them into the chamber for 90 minutes. 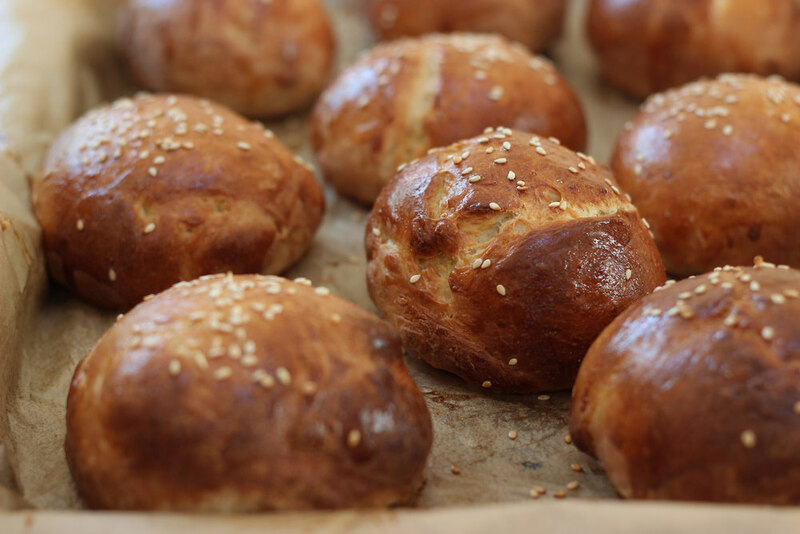 After waiting for the buns to double in size, brush with beaten egg sprinkle with sesame seeds, and bake at 200°C for about 20 minutes until lightly golden. Leave to cool before using. Leave the oven on once you take them out. Take the burgers out of the sous vide once they’re done and chill down. Fire up the BBQ coals and oil the bars well. Into a large roasting pan place the butter and oil and put into the oven to heat up for 5 minutes. Turn the heat up to 220°C and add the drained wedges to the pan. Mix the oil over them and place into the oven for 15 minutes. Remove from the oven and mix again, then sprinkle over the cajun mix and mix again. Place back into the oven for another 15 to 20 minutes to crisp up, shaking them a couple of times to get them evenly crispy. When ready to finish the burgers, take them out of their pouches and dab dry with kitchen paper. Season with salt and pepper on both sides and get them onto the coals for 3.5 minutes each side – cooking with the BBQ lid on. 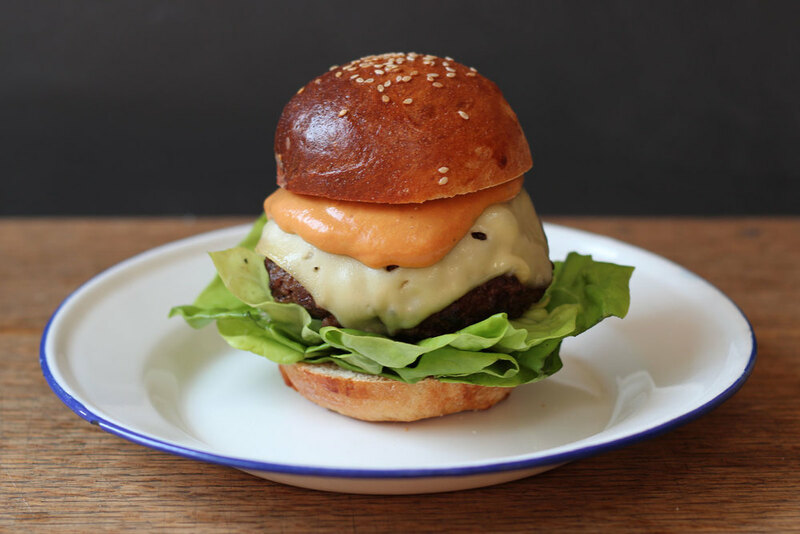 Serve on the brioche buns with lettuce, special sauce and cheese with wedges and slaw on the side.